What’s a Prime without a trailer? Fans Hobby has put the finishing touches on their MB-01 and MB-04 with these awesome transforming battle trailers! The trailer comes in two variations, today we will be looking at MB-09b, the colour variant designed to match MB-04 Gunfighter II, their rendition of a Masterpiece style G2 Laser Optimus Prime. To my knowledge the only difference between the two is the use of red vs silver for the piping on the side of the trailer, and the colour of the included alternate head. 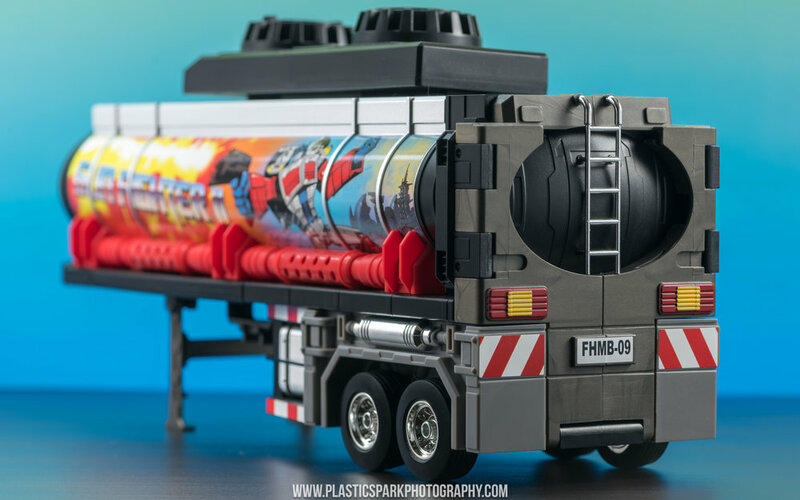 The trailer mode is basic but effective, it’s a long tanker style trailer that attaches via an included peg adaptor to the rear of Gunfighter II in alt mode. 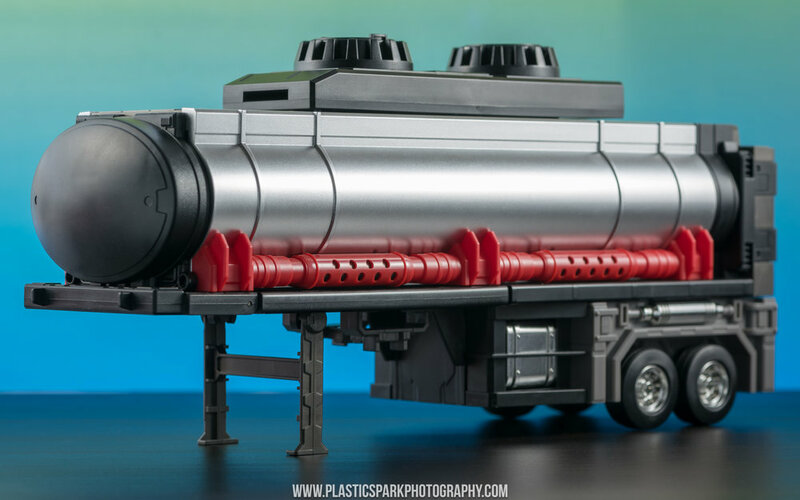 There are also included adaptors to allow the trailer to be pulled by Takara MP-10 Convoy/Optimus Prime and Fans Hobby’s other truck, MB-06 Power Baser. There is storage provided on the bottom of the trailer for the new forearm weapon mounts as well as a fold out set of legs to display the trailer without a truck attached. The disc launcher weapon on the top can be rotated and utilized in this mode. The small details such as the ladders, foot holds, and gas tanks, as well as the use of rubber tires and high quality chrome applied to certain components adds a premium level of finish to this piece. Combined with Gunfighter it makes for a large and impressive display piece. Just make sure you’ve got a large shelf as this thing is huge! Both sets include a sticker sheet with Gunfighter II art provided by legendary Transformers comic artist, Geoff Senior however they both feature the Gunfighter figure and name, there is no Arch Enemy variant. I’m not usually a big fan of stickers when it comes to Transformers outside of the odd badge here and there but the addition of hazard markings, as well as the full size sticker included with Geoff Senior’s artwork are well made and easy to apply. They look good on the final product as well, filling in a few blanks spots that would draw your eye otherwise. You have to unscrew the red piping on the side of the trailer to apply the artwork sticker, but it’s an easy job that only requires removing 3 screws that hold the piece on. I particularly like that this hides the bottom edge of the sticker and should help to prevent peeling down the road. I personally applied a sticker to one side so that I can display the trailer with or without the artwork on display. 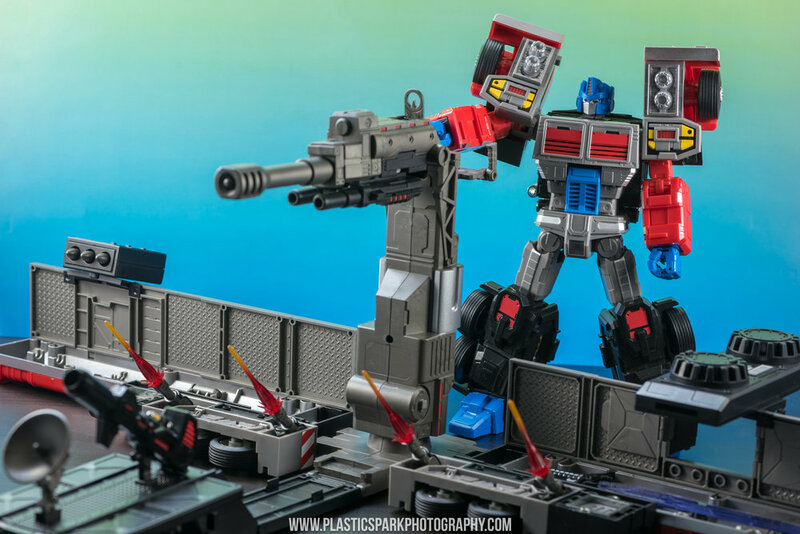 Trailer mode unfolds easily and intuitively into a wonderful battle station play-set for Gunfighter II and any other G2 Autobots that want to fight the good fight with him. I was able to perform the transformation without any instructions though a large clear instruction booklet is included if needed. There are a couple small elements that I would recommend referring to the instructions for such as the removal of the central blaster, and loading of the disk launcher, to avoid any damage due to improper handling. I like that storage options are available for Gunfighter’s sword and blasters making the base mode feel like it truly belongs to him. 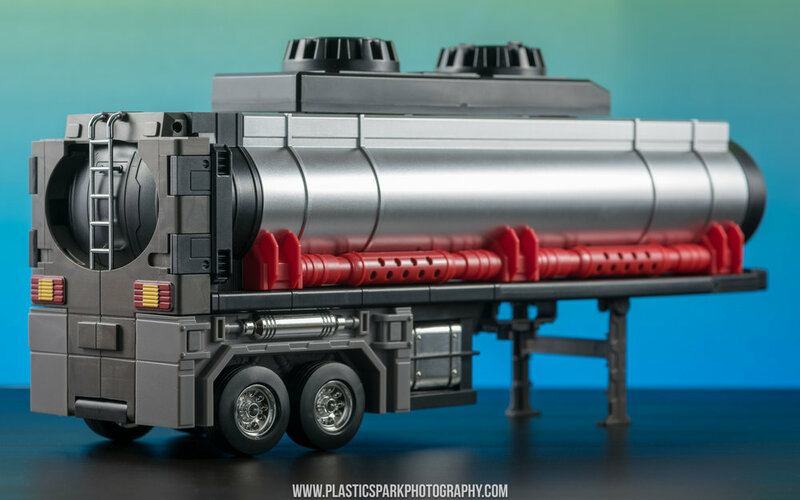 The easiest way to transform the tanker is the stand it on its rear, fold open the front of the trailer, and then the two sides and front section one by one. The front section can be set up fully outstretched, or with an angled ramp in the front. The missile launcher and disk launch both rotate and fold out into firing positions, and there are two flaps that fold out to stabilize the disk launcher as it is quite heavy. There are a number of small cannons that can be extended, 2 on either side as well as a double barreled blaster in the front. The central cannon unfolds and you rotate the front of the blaster 180º to line up with the rest of the cannon and a small clip holds it in place. Two fold out panels on the underside of the cannon add mass to the weapon and help hide a weapon mount that can hold Gunfighter’s double barreled blaster. Swing out the handles and pop up the targeting reticle to complete the battle station. The whole unit is a whopping 27” from edge to edge making it an enormous and impressive display piece. There is an alternate battle station mode that can be achieved by removing the central cannon via twisting and pulling upwards, unfolding it flat, and clipping the large handle into a clip on the black central portion of the battle station. The battle station has to be in the ramp configuration to achieve this. Two handles slide out from the rear of the blaster for Gunfighter to hold and the whole cannon can move on a ball joint connection. 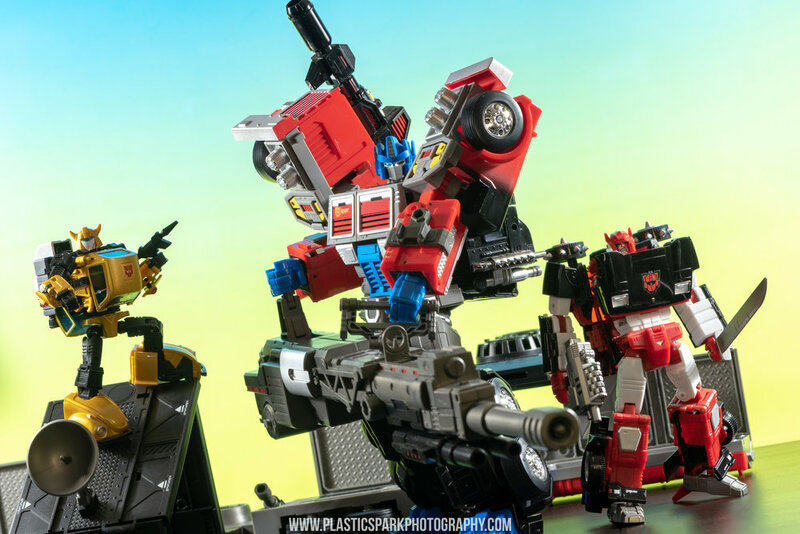 The battle station makes for a versatile display stage for all scales of Transformers figures. I was even able to make it into a concert venue for Soundwave and his cassettes! The trailers various munitions can be stored in the launchers and in dedicated storage spaces in the trailer. I like that everything has a dedicated spot and nothing is left rattling around loose. I was incredibly surprised to find that all the weaponry is functional! The triple missile launcher has three individual spring loaded launchers, the main cannon has a single button activated launcher, and the disk launcher can store all of the included disks and fire them rapid fire via spinning the rear circular gear. This came as an absolute surprised to me as I hadn’t read about this feature at all. I really enjoy the functional weaponry as really feels like a real play set from my childhood. There’s an incredible nostalgic wave that washes over me as I scramble to find the missile I launched to the other side of the room. 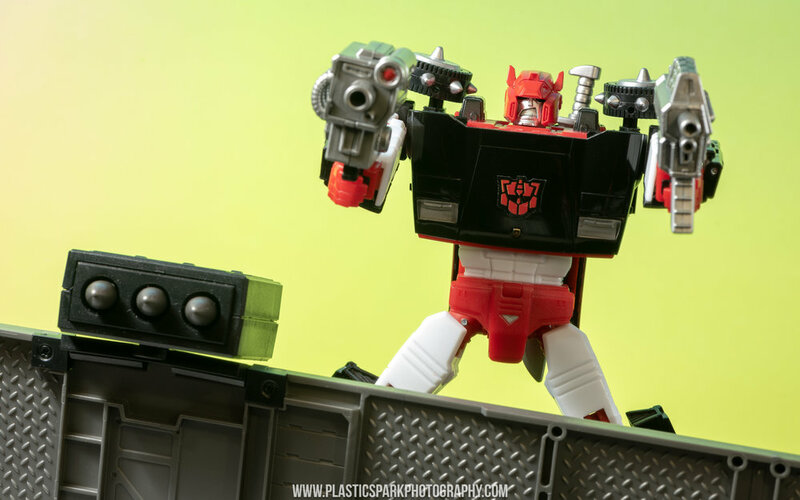 There are also included blast effects that can be used for the small laser cannons on the battle station, as well as with either of Gunfighters blasters or his shoulder launchers. The central cannon can be removed and equipped to Gunfighter as a large mobile artillery as well. Simply twist and unlock the cannon from the base, and fold out the rear handle. This handle has to be placed into Gunfighter’s hand sideways to match the groove in the tab with the slot in his hand, the second hand holds onto the blaster via the large ball jointed handle in the mid-section. There is a limit to how Gunfighter can be posed while holding this giant piece of weaponry but the visual impact is incredible. This is weapon happy G2 madness to perfection. The new head is a nice blend of modern design styles with the shorter ears of the G2 design. I also found that you can swap out the longer ears from the original head onto the new head if you'd like longer antennas with the cleaner face-plate and larger forehead crest of the new head. The blues are slightly mis-matched but not enough to really notice. Fans Hobby delivers yet another fantastic piece with the MB-09b Battle Trailer. The materials and paint go above and beyond, the number of included accessories is insane in the best way, and the play-ability of the battle station mode with its functional weapons and blast effects is something that makes me smile like a little kid at Christmas. I was initially sceptical at the idea of a separately available trailer for MB-04 and MB-01. There tends to be a lot of push-back when it comes to add on accessories for figures, with people concerned that these items should have been included with the figure at the original time of release. I can tell you that Fans Hobby have gone out of their way to make sure that the MB-09 Battle Trailer feels like a true upgrade to the original experience and includes so much that the price tag is justifiable. I really only have one critique, which is that I would have liked a set of stickers without the "Gunfighter II" text. 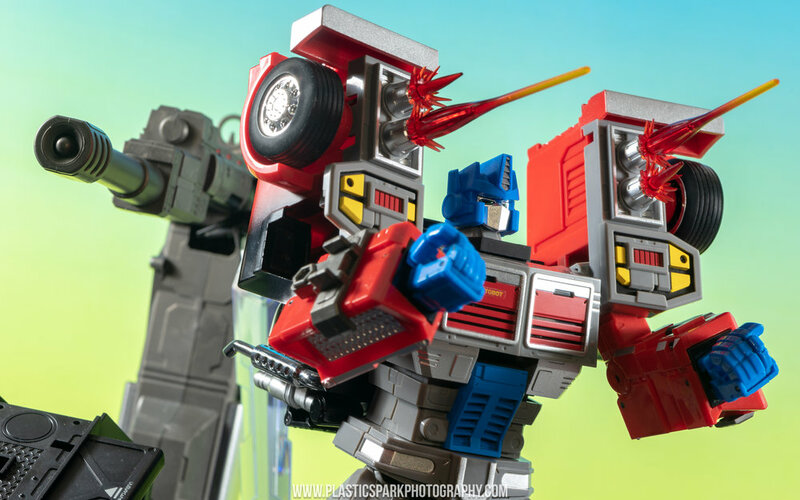 I realise that its an homage to the original G2 prime sticker design but the giant Gunfighter text makes a bit less of an impact since it's not a proper character name, and rather the chosen name of Fans Hobby's homage figure. A full art sticker of Geoff Seniors amazing artwork would have been a nice addition. If you like to play with your Masterpiece figures, if you like to set up awesome battle displays and shoot spring loaded plastic missiles across the room then the MB-09 trailer is an awesome addition to an already great figure. I want to thank Fans Hobby for working with me and letting me check out this piece. If you’d like one of your own you can order directly from Fans Hobby here. You can also order the Arch Enemy version here. Please check out the full gallery below for more photos. Thank you so much for checking out my review of the Fans Hobby MB-09b Battle Trailer. 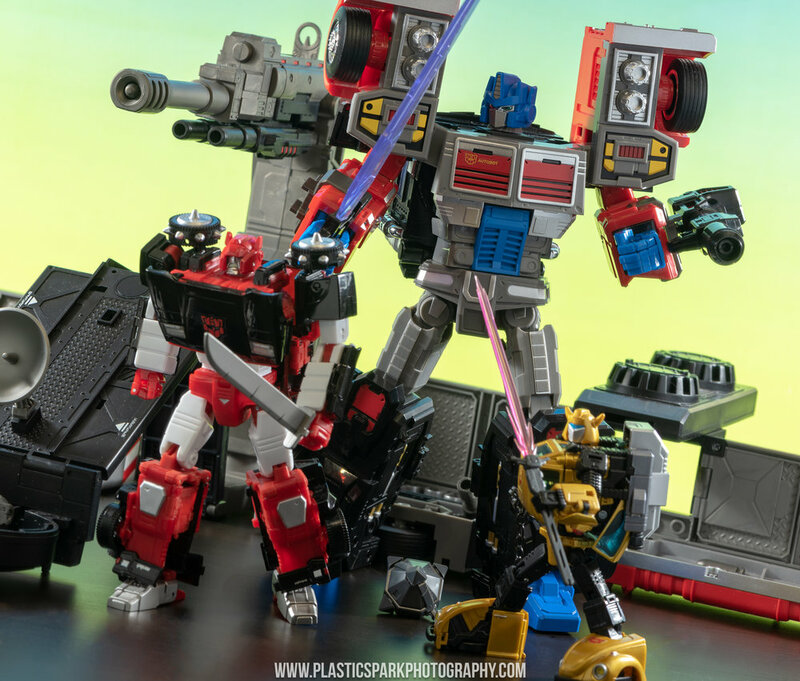 I hope you found the review informative and enjoyable, please leave any comments, critique, or questions down below, contact me via Facebook, or email me at plasticsparkphotography@gmail.com.